With the company of angels. Question: How can we enjoy the company of angels? Similarly, when we think of an angel, there are two qualities that immediately come to mind: sweetness and brightness. Sweetness in brightness and brightness in sweetness are the predominant angelic qualities. If we can also have that sweetness, brightness and subtlety, then definitely we can be in the midst of the angels.Even in an ordinary family, mothers often say about their children, “He is an angel,” or “She is an angel.” They are not thinking of their children’s mental capacities or other talents at that time. They are only thinking of their sweetness. As soon as we think of an angel, we imagine someone who is sweet, delicate, subtle and bright. This is the angelic touch. Angels can come to earth if they want to visit people or see some people who are very dear to them. Angels can take the form of a relative and come to someone who may be going to die in a few hours. At such times, angels can act as the direct representative of the divine force to take somebody into the other world. When somebody is about to die, we often hear them say that an angel has come. But fairies do not or cannot do that kind of thing. Fairies deal mostly with children, whereas angels deal with all human beings irrespective of age. Angels also like children very much. But in terms of receptivity, elderly people receive more blessings from angels because they are more conscious of the angels’ divinity. Children do not know what divinity is, so in that respect their receptivity is missing. Elderly people get more benefit when they think of an angel or meditate on an angel; at that time they are filled with joy. Children may hear all about angels from their parents and they may get joy by hearing the word ‘angel,’ but they have no idea how angels can help them in their daily lives. If you see an angel, you really feel something. Everything changes for a few minutes or a few days. Your consciousness changes; you are flowing. It is so beautiful. 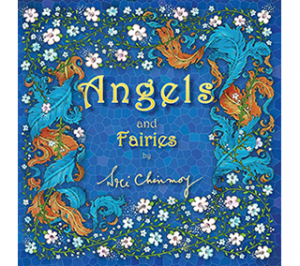 Do you want to know more about angels, fairies and other beings? 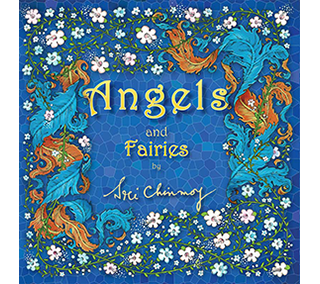 Angels and Fairies by Sri Chinmoy is an illustrated book full of profound answers to some very interesting questions. Its beautiful design also makes it a wonderful gift! Also right now on our website you can receive the book for only £9.99 (original price £11.99) and with free postage! Just use the discount code ANGELS at checkout!